Place cookies in small resealable food-storage plastic bag. With hand or rolling pin, crush cookies. Sprinkle about 1 tablespoon crushed cookies on top of each cup of pudding. Cut chewy fruit snack into 12 (1-inch) pieces. 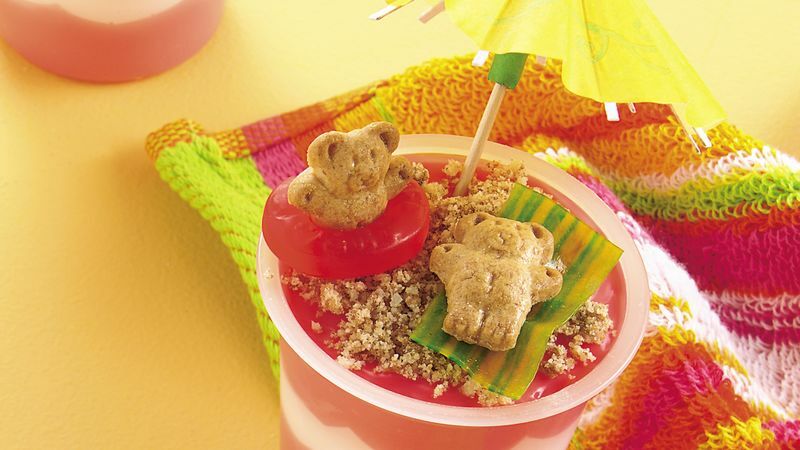 Peel each piece of fruit snack from plastic backing; place over crushed cookies on pudding for "beach towel." Top each "towel" with teddy bear and umbrella. Place 1 hard candy around each remaining teddy bear for "inner tube"; place 1 on each pudding cup. In place of the cinnamon shortbread cookies, use vanilla wafer cookies.